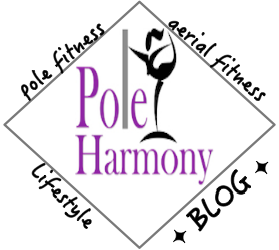 This month's community pole challenge is Tropical Vertical's instagram #AprilAlphaPole. Every day of the month of April will represent a letter of the alphabet with Sundays being rest days. My struggles: back flexibility. Where did it go? Allegra: I felt like my head should have been higher and closer to my top leg. I did get a pretty shape but you would not believe how many times I attempted this one. Entry from Flatline Scorpio turned into inner leg hang to spare my energy as I was only on letter A.
Butterfly: This move has always been pretty solid for me. Why is it when you're up in the move you feel like your back hooked leg's foot is right next to your head and then upon examining your video on playback it's light years away? DragonTail: Not sure why I did this one. I was stumped on moves that started with the letter D. I could have hooked that back right leg to complete the "tail" of the move but all my concentration was fixated on my grip. I have a side by side comparison to show the depreciation in my back flexibility on this one- which I feel would have given this move the little bit of umph it needed. It also shows that I'm also not fully extending the left arm over my head and grabbing the pole. (This is why it's always good to go back over your execution plan and map out where each leg and arm are supposed to be in your final product.) Planning fail. It's quite possible that the over head arm placement could be exactly what I needed to arch my back a little more into this move thus creating the illusion of back flexibility. I'll have to test this theory out and will post an update on my findings. Please don't forget when posting your contributions to the challenge to include the move name with the industry hashtag: #pd(move name) to make searching for your move or variation of each move easier. What moves did you choose for the first week of the challenge? Feel free to comment below your #AprilAlphaPole picks. Follow my instagram for my next couple of letters as a few worked best in video sharing versus pictures.